Leonardo Da Vinci was born in the small Italian village of Vinci in 1452. He was raised by his grandparents, and when he was very young he displayed a remarkable ability to solve complex mathematical problems. At the age of 14, his father took him to Florence to study under the great artist Verrocchio. Verrocchio was a master painter, sculptor, and goldsmith. Immediately, he was amazed by Leonardo's ability to capture life on canvas. Verrocchio often painted main sections, while leaving the details for his apprentices to complete. He would discover Da Vinci's talent after painting a baptism of Christ surrounded by angels. Verrocchio was completely amazed by Da Vinci's angel. He said that the angel was more alive than anything he had ever painted. At the age of 20, Leonardo would leave his teacher and begin painting on his own. At this time, Da Vinci would produce some of the most famous paintings in the world including the Mona Lisa. A decade later, when Leonardo was in his 30's, he would begin serving the Duke of Milan, Ludovico Sforza. By all accounts, Da Vinci was never held in high regards by the Sforza royalty. However, Milan would have its rewards for Da Vinci. It was in Milan that he first became interested in scientific inquiry. It would occupy him for the rest of his life. Leonardo spent much of his time with the Sforza's designing military equipment. While working for the Duke, Leonardo developed canal systems, while painted many of his greatest works, including The Last Supper, and the Madonna of the Rocks. After French troops invaded Milan in 1499, Da Vinci returned to Florence where he painted the amazing half portrait the Mona Lisa. The Mona Lisa is a painting of an Italian woman named Lisa del Giocondo, and it has been on permanent display in The Louvre in Paris, since 1797. Its fame spread when it was stolen on August 21, 1911, and Pablo Picasso was first suspected as the thief. Picasso was later vindicated, and the real thief was actually a Louvre employee who had hidden in a closet until after closing time. Before its theft it was not widely known outside of France. It has been vandalized several times since. In 1506, Da Vinci returned to Milan to work for King Louis XII, the King of France. Then in 1512, he was sent to Rome to work on the designs of the new Church of St. Peter. 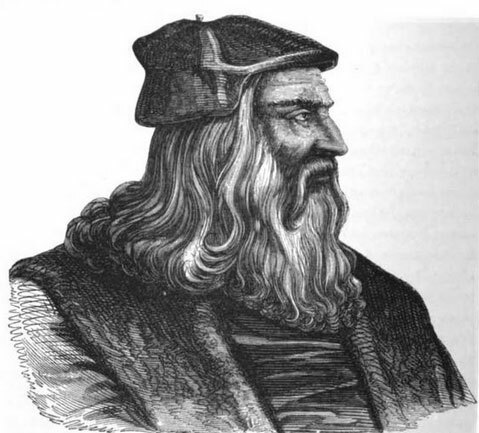 Four years later he would again return to France to work for King Francis I. Da Vinci would develop a close personal relationship with the king before dying on May 2, 1519. We know a great deal about Leonardo thanks to his notebooks because approximately 5,000 pages survive. He was primarily occupied with finding out how things moved. Leonardo loved to draw birds in flight, carefully detailing the muscles, tendons, and bones. He also was very interested in mechanics. Leonardo Da Vinci had plans for machine guns, helicopters, central heating, airplanes, parachutes, and irrigation systems. He also studied botany, astronomy, and geology. During his lifetime, Leonardo would dissect more than 30 cadavers while studying human anatomy. Most of his paintings just disappeared over time. Approximately a dozen of his paintings survive today, and as well as some parts of various statues. At the time of Leonardo's death, historians believe that he considered himself a failure, and as a result he suffered from depression.